Home / Uncategories / What does MRAM mean? 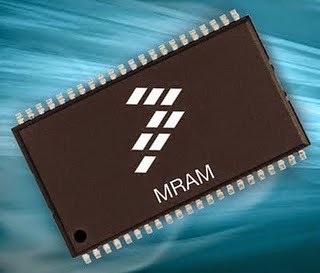 MRAM means 'Magnetoresistive Random Access Memory'. MRAM is a method of storing data bits using magnetic charges instead of the electrical charges used by DRAM (dynamic random access memory). Scientists define a metal as magnetoresistive if it shows a slight change in electrical resistance when placed in a magnetic field. By combining the high speed of static RAM and the high density of DRAM, proponents say MRAM could be used to significantly improve electronic products by storing greater amounts of data, enabling it to be accessed faster while consuming less battery power than existing electronic memory. So what does it mean to me? 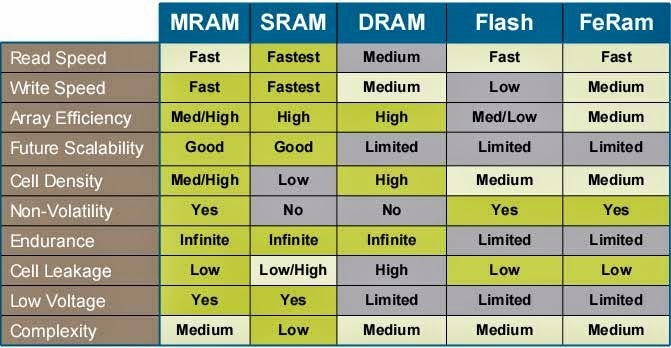 MRAM can actually replace all the memory in our computers - DRAM, Flash and even Hard-Discs. It can also be speed-competitive with SRAM (the CPU cache memory). MRAM-enabled computers will be able to be turned-on instantly (because there will be no need to have several memory types like today). MRAM in mobile devices can mean more storage, and longer battery life. MRAM normally functions by constructing minuscule magnetic fields at intersections in a grid of nanoscopic power rails. When current attempts to travel through a power rail which is opposing the polarization of one of the magnetic field bits, its current flow is mitigated and the bit value stored by the field is detected by this weakened current flow. MRAM, however, retains data after a power supply is cut off. Replacing DRAM with MRAM could prevent data loss and enable computers that start instantly, without waiting for software to boot up. Base for development of MRAM? 2) tunneling magnetic resistance, or TMR, which is expected to be the basis of future MRAM.